Nordstrom: Keeping department store shopping hip and relevant. When my mom used to take me clothes shopping, we had a bit of a disagreement over where to shop. I would have preferred to go to individual stores like the Gap, Banana Republic or Old Navy (ignore the fact that those are basically the same store). But my mom preferred department stores like Bloomingdales, Saks or Marshall Fields (RIP) because they had good service, good quality, a wide variety — and because she had credit cards there. I didn’t like the department stores, though, because they felt too old-fashioned to me. I felt like I rarely saw girls my own age the department stores. You didn’t buy “pants” at department stores, you bought “slacks.” Department stores were staffed by disapproving older women, played fusty muzak, had headache-inducing lighting and were organized in confounding and monotonous ways. I felt that way until I discovered Nordstrom. Nordstrom has everything that’s good about a department store, I.E. everything under one roof, but somehow manages to make shopping a fun experience. I’m not a consumer genius so I’m not sure exactly what it is but I think it’s a combination of their lighting (bright but not blinding), layout (open, without that never-ending college-library circular maze feel) and selection (wide but not overwhelming, like someone actually decided there were items they would not show or sell you). Good service exists at Nordstrom, too, even if you don’t look all rich and fancy the way things often go at Neiman Marcus (AKA “Needless Markups”— haha, up here, high five!). I’ve had Nordstrom salesgirls go above and beyond the call of duty to help me track something down, or find something I needed but couldn’t articulate, or even suggest something I would have never tried before, but without making me feel like a chumpy walking commission. Most importantly: Nordstrom gives you cash for returns. There’s something really wonderful about turning a piece of merchandise you don’t want into some cash you actually need. It’s like Nordstrom is the realistic, considerate wedding guest who knows the bride and groom could always use cash; if they want to spend it on boots, fine, but if they need to put it towards dog food, that’s OK too. But now I have another reason to feel good about shopping at Nordstrom: The company has made a point of openly supporting gay marriage, stating so in a company-wide memo. I admit I am not the most conscientious shopper when it comes to supporting or not-supporting organizations based on their belief systems (it’s easy for me not to patronize Chik-Fil-A mostly because of the calories and tummyache). I would have continued to happily shop at Nordstrom had it failed to ever make a public announcement on its stance on gay marriage. But I admire the company president and executives for taking a public stance on equality, probably just because they really didn’t have to. The store will undoubtedly lose some shoppers, and it may gain a few new customers, but I think more important are the consumers who probably never expected that shopping at a department store would make them think twice about marriage equality, the ladies who go to Old Orchard Mall on weekend afternoons or the teenagers cruising the Uggs collection. It’s nice knowing that they might give this topic a second thought while they’re pulling out their credit cards. 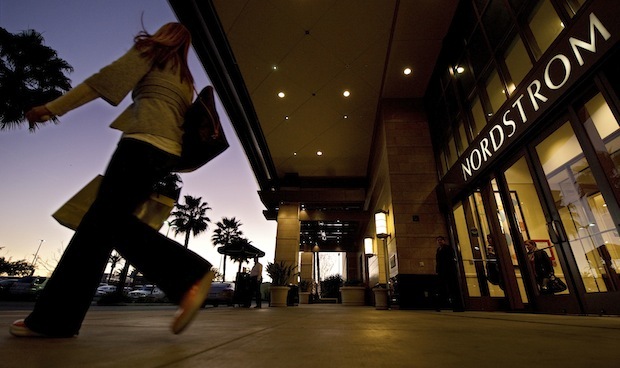 So there’s a new way that Nordstrom is keeping department store shopping hip and relevant. Getting cash back for returns is still probably my favorite thing about the chain, but taking a public stance on inclusion is pretty cool, too.